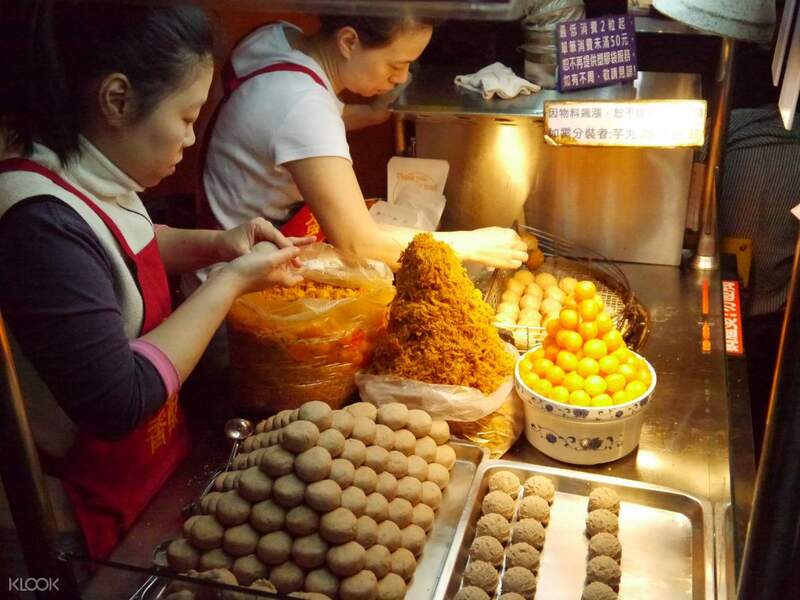 Go on a gastronomic adventure in Ningxia Night Market with this food tour! An excellent tour! Joanna met me promptly at the MRT and we headed off for the market - I was the only person on the tour last night, but it still went ahead, which I was very pleased about. Joanna explained the history of Taiwan and the reasons behind the great diversity of food found here. When we got to the market, she showed me all sorts of different things, and I could try whichever ones I wanted. The pork dumplings were delicious - and so was the pig’s blood, surprisingly! I also tried an amazing pork bun sandwich, ice cream with peanuts and coriander, fried taro balls, shaved ice dessert - and they were all excellent. Joanna was a very good guide, she speaks clearly and explains everything you want to know. I highly recommend this tour. Itching to try something new? Join this food tour in Taipei for a taste of unique local dishes! 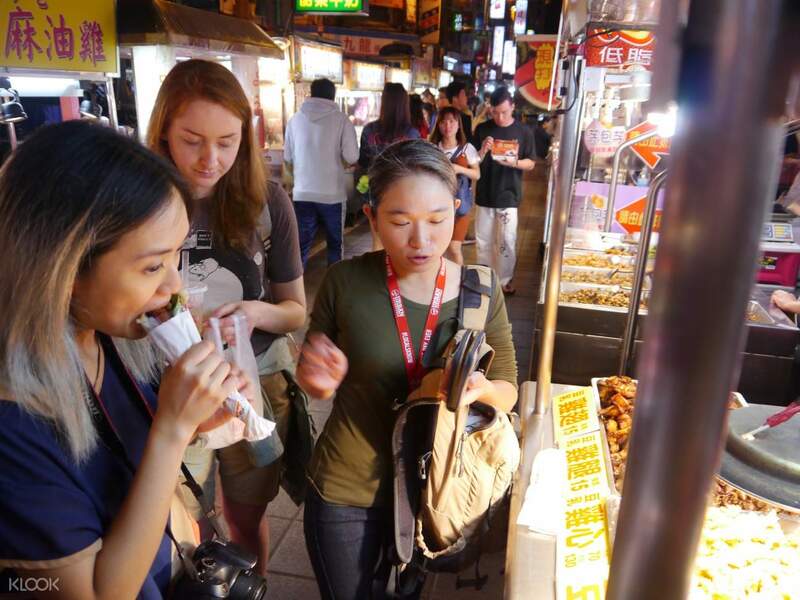 Introduce your palate to delicious food options at Ningxia Night Market, one of Taipei's most frequented night markets, with hawkers included in the Michelin Guide Taipei 2018 Bib Gourmand Selection. Learn more about this outdoor food night market through your English-speaking local guide as he takes you around the most notable hawkers in the area. 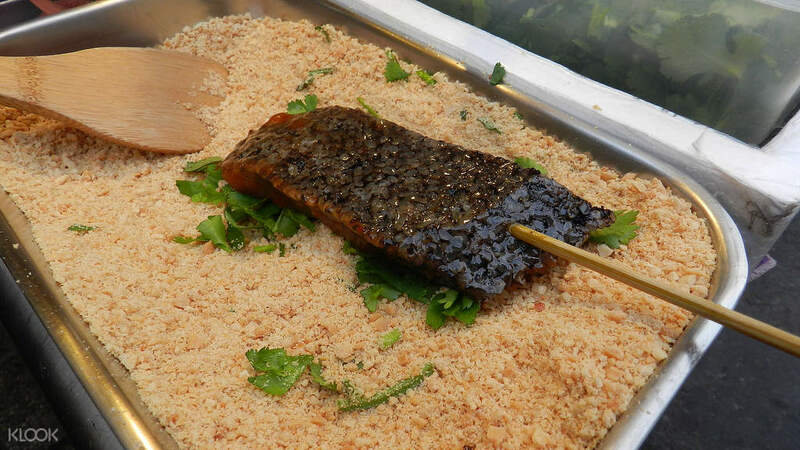 Sample 5 local dishes of your choice within the market for a flexible dining experience. Kickstart your appetite with a classic Taro Ball, the most versatile food in Taipei cuisine. Eat it with an egg for a suitable starter meal or dip in a soup for your early dessert - mildly weird combinations but totally delicious both ways! Next up is the Karasumi, or more commonly known as the Mullet Roe. This Taiwanese delicacy is baked until rosy red, a color you'll definitely dream of once you're craving for more. For other options, a variety of rice bowls and vegetable meal are available in every stall. Mix and match dishes to get the perfect combination for your taste. For an even more exciting experience, join the tour's Bizzare Food Challenge! Let your local guide do the choosing and try your best to eat three unusual delicacies. Win the challenge and get the "Certificate of Real Local People" award! 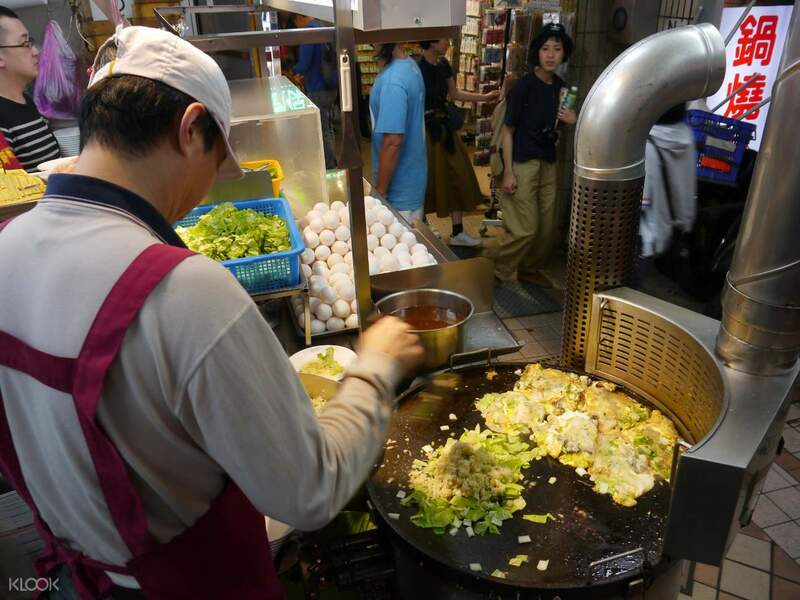 Immerse yourself in Taipei's food culture through this tour! Learn more about the local culture and the people while munching on food in this tour! An excellent tour! Joanna met me promptly at the MRT and we headed off for the market - I was the only person on the tour last night, but it still went ahead, which I was very pleased about. Joanna explained the history of Taiwan and the reasons behind the great diversity of food found here. When we got to the market, she showed me all sorts of different things, and I could try whichever ones I wanted. The pork dumplings were delicious - and so was the pig’s blood, surprisingly! I also tried an amazing pork bun sandwich, ice cream with peanuts and coriander, fried taro balls, shaved ice dessert - and they were all excellent. Joanna was a very good guide, she speaks clearly and explains everything you want to know. I highly recommend this tour. An excellent tour! Joanna met me promptly at the MRT and we headed off for the market - I was the only person on the tour last night, but it still went ahead, which I was very pleased about. Joanna explained the history of Taiwan and the reasons behind the great diversity of food found here. When we got to the market, she showed me all sorts of different things, and I could try whichever ones I wanted. The pork dumplings were delicious - and so was the pig’s blood, surprisingly! I also tried an amazing pork bun sandwich, ice cream with peanuts and coriander, fried taro balls, shaved ice dessert - and they were all excellent. Joanna was a very good guide, she speaks clearly and explains everything you want to know. I highly recommend this tour. We enjoyed this tour - our guide was informative about the food and very flexible with what to order. We enjoyed this tour - our guide was informative about the food and very flexible with what to order. I was sadly underwhelmed with this tour. The host was sweet and knowledgeable but the food was not appetizing, the market was very crowded and difficult to navigate, and we did not stop at a single Michelin star hawker stand. The food purchased added up to approximately $10 and I feel the price of the tour is not at all justified. I was sadly underwhelmed with this tour. The host was sweet and knowledgeable but the food was not appetizing, the market was very crowded and difficult to navigate, and we did not stop at a single Michelin star hawker stand. The food purchased added up to approximately $10 and I feel the price of the tour is not at all justified. Thank you for raising your concern to us. We sincerely regret to hear about the inconvenience you experienced, and we take your feedback extremely seriously. Your case has been noted and passed to the product manager for further investigation. Our specialist will get in touch with you shortly. Your understanding will be much appreciated. Thank you for raising your concern to us. We sincerely regret to hear about the inconvenience you experienced, and we take your feedback extremely seriously. Your case has been noted and passed to the product manager for further investigation. Our specialist will get in touch with you shortly. Your understanding will be much appreciated. Our guide was very nice and incredibly knowledgeable about Taipei’s history and about the evolution of the Night Market. That being said, the foods we got to try were definitely not worth the price of the ticket. None of the foods we tried were Michelin rated. It would have been much less expensive to walk through the market and try something on your own. I estimate that we each ate about $10 USD of food before the tour ended. Our guide was very nice and incredibly knowledgeable about Taipei’s history and about the evolution of the Night Market. That being said, the foods we got to try were definitely not worth the price of the ticket. None of the foods we tried were Michelin rated. It would have been much less expensive to walk through the market and try something on your own. I estimate that we each ate about $10 USD of food before the tour ended. We didn’t go to any Michelin-rated restaurants. You could easily go to the night market and do the tour yourself for $5. The tour guide was a nice gentleman. However, save your money. We didn’t go to any Michelin-rated restaurants. You could easily go to the night market and do the tour yourself for $5. The tour guide was a nice gentleman. However, save your money. Thank you for raising your concern to us. We sincerely regret to hear that you had an unsatisfactory experience and we take your feedback extremely seriously. Your case has been noted and passed to the local operator for further investigation. Our specialist will get in touch with you shortly. Your understanding will be much appreciated. Thank you for raising your concern to us. We sincerely regret to hear that you had an unsatisfactory experience and we take your feedback extremely seriously. Your case has been noted and passed to the local operator for further investigation. Our specialist will get in touch with you shortly. Your understanding will be much appreciated.